It’s so easy to get into a zone of hypochondria when searching about your health concerns online. We’re all a little guilty of consulting “Dr. Google” and getting worked up about what we find, which is usually worst-case-scenario information. Your light cough turns into emphysema and that mole turns into melanoma—or so it seems. Google searches don’t necessarily indicate the prevalence of any one condition in your area, but rather, they can show what people in your state are most concerned about regarding their health or the health of a loved one. That’s not to say that some searches aren’t fueled by legitimate worry, but most of the time, there’s nothing to concern yourself with until you’ve seen an actual physician. On the other hand, it’s intriguing to see what the people in your locale are most paranoid about. Take a peek at the map to see what health concerns the people in your state are most anxiously searching for. We started by identifying the most frequently searched medical conditions on Google Trends over the past year. Then, we listed each of these conditions, along with any corresponding conditions, and ran them back through Google Trends to find out which states (including Washington, DC) had the highest search volume for each condition. While our findings may not provide a solution to your health concerns, they do offer some insight into which medical problems the people in your state are most worried about. The most googled medical condition in the US was ADHD, with nine states searching for the condition more than any other health concern. According to the CDC, 9.4% of children aged two to seventeen years old had been diagnosed with this condition in 2016. The medical issues that came in at second and third place, respectively, were syphilis and HIV/AIDS. Nevada’s most googled medical condition was skin cancer, which makes sense given the scorching summers that residents of this state face every year. Iowa searched for “binge drinking,” and it just so happens that the state holds the fourth highest position in the US for binge/chronic drinking. Louisiana and DC both searched for HIV/AIDS for the second year in a row. These states are also included among the states with the highest rate of reported HIV cases in the US, according to the CDC. Kentucky searched for Hepatitis A, likely because the state experienced a large outbreak recently. Georgia searched for syphilis for the second year in a row. The Peace State also has one of the highest STD transmission rates per capita, according to CDC data. Idaho’s most googled health concern was E.coli, which makes sense given that the state was “hit hard” by an outbreak of the bacterial infection this past year. Oklahoma searched for “diabetes,” which could be explained by the fact that the state has the ninth highest rate of obesity in the country. Vermont was searching for information about opioid use disorder, and as it sadly turns out, the state has one of the highest rates of opioid deaths in the US, according to the CDC. Connecticut searched for “quarter-life crisis,” which is interesting because The Constitution State has one of the oldest median ages in the country at 40.9 years of age. While there were some commonalities in state-by-state web searches (like ADHD in nine states, syphilis in six states, and HIV/AIDS in four states), most locales had unique results depending on their current outbreaks and other health-related concerns (like the Hepatitis A outbreak in Kentucky and opioid use disorder in Vermont, which has one of the highest rates of opioid-related deaths in the country). Still, it’s important to note that scheduling regular wellness checks and consulting your doctor as needed is much more proactive and effective than searching for a diagnosis from “Dr. 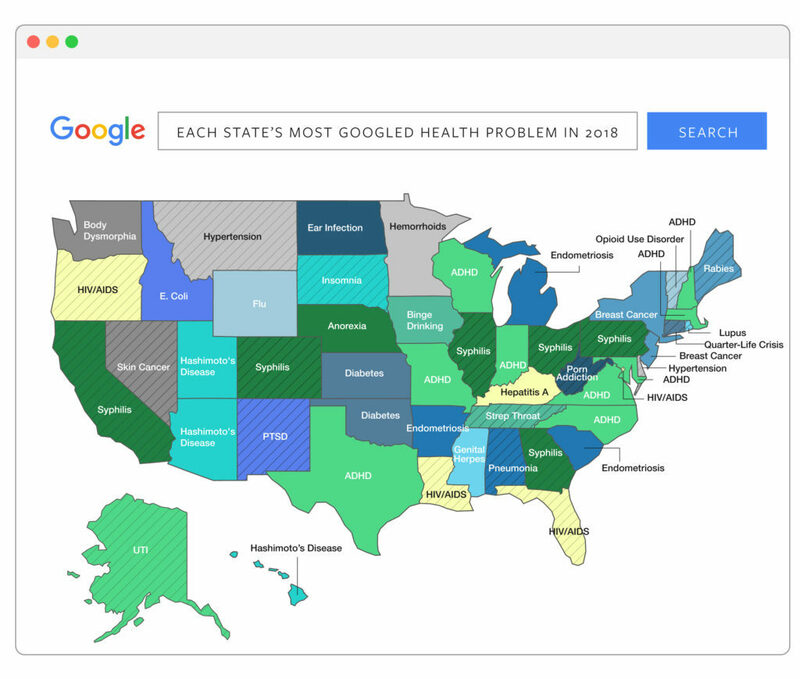 Google.” Did your most paranoid health-related searches match your state’s primary concern? Share with us in the comments (and stay safe out there).